Blue Benadum is the creator and race director of the inaugural Malibu International Marathon. Blue is a marathon runner as well and pretty good one, finishing the last Passadena marathon in 2nd place in 2:44:17! Hello, on November 15th 2009, you’ll be organizing the Malibu International Marathon . Can you tell us where it is located? It is located in Los Angeles county, California, on the coast of northern Malibu and southern Ventura County for the start. This will be the first edition of the race. Why was it created? Our running team, Forever Runners, competes in marathons all over the world every year and though we have members internationally, our roots are in Malibu and much of our training is done on the beautiful beaches and mountains. So we wanted to bring it home one weekend out of the year and share the playground we feel so lucky to live in. I designed a course that could be fast. I am always trying to get that next PR and I know its a goal for a lot of runners. This was a challenge in Malibu because the mountains shoot straight up out of the ocean. So we start in the farmlands north of Malibu in south Ventura County at the Camarillo Airport. We run the first ten miles towards the Navy base at Point Mugu through flat farms bordered by the Santa Monica Mountains to the the runners left. At the base we turn onto the Pacific Coast Highway and head south. Two miles later, just before the halfway point, we come through a rock passageway and popout on the undeveloped coastline of Point Mugu. Its like going back in time and we will see no development until mile 20. This is my favorite part of the course and its still flat. Mile 20 takes you past Neptunes Net, the famous restaurant of many Hollywood films, and the surf beach called County Line. Here is the first of the rollers that will challenge your legs for the last six miles as you pass the celebrity filled homes along the ocean bluffs. Once you pass the Malibu sign, it is all downhill, for the last mile and a half. Passing Starbucks, you bear right into the Zuma beach parking area and finish line! Congratulations, the first run to Malibu is yours! We hope to have around 6,000 runners but in the first year its just so hard to say. Malibu is such a destination city, we may sell out. We will also have a half marathon, 5k, and are also really excited to include our stand up paddle surf race. The half marathon will be the last half of the full and the stand up paddle will go from County Line to Zuma, a seven mile paddle. November is an adventerous month! It can be hot or cool, calm or windy. Luckily we can count on the fact that it wont be really cold and if its windy, we should get a nice push from behind for the last 14 miles. We are still planning the after race show and will have a pasta dinner at the famous Duke’s restaurant and a VIP dinner at the Malibu Racquet Club catered by the delicious foods of the Godmother Cafe. 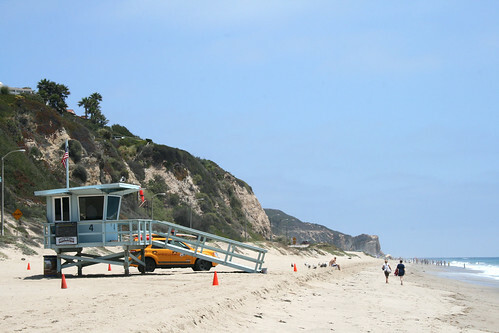 The 2 day expo will be under tents at Zuma beach. 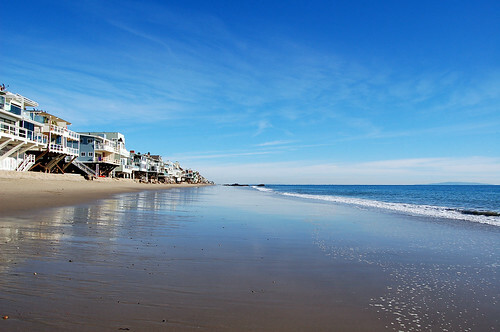 The marathon finished, what advice would you give a runner who has never been to Malibu before? A good restaurant, a fancy sightseeing? After the race, visitors must visit the historic Surfrider Beach and join or watch the longboarders ride the swell. Relax on the pier overlooking the surf with some drinks and food at the Beachcomber cafe and restaurant and take in the legendary sunset over the Pacific. It will be obvious once you arrive in Malibu that wherever you end up eating or spending the evening, you really cant go wrong, its paradise. You may have to stay awhile. In a single sentence, what would you tell the readers of 42k195 to make them register for the Malibu International Marathon? In one sentence: this is one heck of an excuse to come to a place like Malibu and spend the weekend staying active, benefitting good causes and rewarding yourself with some much needed beach time.